Mrs. Williams is licensed in both Tennessee and Virginia, and practices in the areas of civil and commercial litigation, insurance defense and insurance coverage. She has represented a wide variety of insurance companies in claims involving property, premises liability, arson, fraud and personal injury. Ms. Williams has a special interest in the areas of insurance policy interpretation and coverage determinations. She also handles collection matters for various loan companies in the area. During her third year of law school, Mrs. Williams served as a clerk to the Honorable William G. Petty, a justice on the Virginia Court of Appeals. Mrs. Williams was born and raised in Kingsport, Tennessee. While a student at East Tennessee State University, she was a member of the prestigious Roan Scholars Leadership Program, and served as secretary/treasurer of the Student Government Association and as vice president of Alpha Delta Pi Sorority. While in law school, she served as the Notes and Comments Editor for the Liberty University Law Review and received the Distinguished Service Award. Mrs. Williams remains loyal to her alma mater, ETSU, and is a member of the Roan Scholars Section Committee and the ETSU Foundation. She was named to the 2014 Class of “40 Under Forty” by The Business Journal of Tri-Cities Tennessee/Virginia. 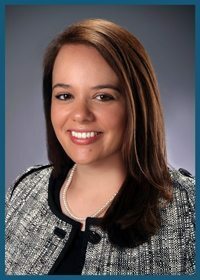 She now serves as President of Northeast Tennessee Young Lawyers Association.